Ontario, Calif. - With the Ontario Fury's postseason odds greatly improved thanks to a dramatic road win over direct competitors Tacoma Stars, Head Coach Jimmy Nordberg has been spending this week balancing his squad's confidence with humility and focus ahead of the upcoming matchup against the El Paso Coyotes. By bagging another victory in the home debut of recent signing and former U.S. and FIFA World Cup star Jermaine Jones, Ontario could move within one win of Tacoma in the hunt for the all-important second place in the Major Arena Soccer League (MASL) Pacific Division. The clash between Ontario and El Paso at Citizens Business Bank Arena is set to kick off this coming Sunday, March 24, at 5 p.m. PT. Tickets may be purchased by heading to www.ontariofury.com or by calling 909-457-0252. As part of the MASL's first nation-wide television partnership, all the action will be broadcast live by Eleven Sports, which, in addition to streaming live on the Twitch platform via its free digital channel Eleven Sports NEXT (www.twitch.tv/elevensportsnext), is available via national cable/satellite systems (DIRECTV channel 623, AT&T U-verse channel 1665, Verizon Fios channel 597) and other cable and OTT providers (RCN 571, Atlantic Broadband 501, Hawaiian Telcom 1091, Sony PlayStation Vue, FUBO TV). The Fury put in a scrappy performance in its road fixture against the Stars, trailing 2-1 at halftime and coming from behind to grab a 4-3 lead in the fourth quarter, only to give up the equalizer off the foot of Michael Ramos with a minute left to play in regulation time. The tally made for maximum suspense, as a loss would have all but ended any playoff hopes for Jimmy Nordberg's players, who ultimately prevailed behind the heroics of goalkeeper Chris Toth in a heart-stopping shootout finale. Said the Ontario Head Coach, "I'm really proud of these guys for never giving up, no matter what happens in a game or what the score is. They've always got grit and fight to them and work hard until the final whistle. This was no exception. I was extremely happy with the effort and the mentality of battling through setbacks and calls that didn't go our way. It speaks volumes about the group that we were able to grind it out in a hostile environment and with our backs against the wall." The Fury now needs just one more win than Tacoma over the course of each team's respective final four regular season games. It's a remarkably hopeful state of affairs, given Nordberg's men have a track record of falling in agonizingly close road games against MASL title contenders all season. Of the side's eleven defeats, six have come via shootout, in overtime or by a one-goal margin. Another two were defeats by two goals to the league-leading San Diego Sockers, including a February 7 decision that was a one-goal game until a chip into the open net with three second left to play and 'keeper Toth off his line to join the attack. "We've had some rough luck and difficult calls over the course of our campaign," offered Nordberg. "That said, we've been telling the guys that these things don't happen to us but for us as chances to learn from our mistakes and mature as a unit. Because we've done that, we're now a more seasoned team that is better prepared and able to win a crucial game like the one against Tacoma." Chris Toth, who joined the Fury during the offseason and enjoyed consecutive world-class showings in his club's past two matches, was rewarded for his standout play against the Stars with a nomination to the MASL Team of the Week. The netminder made 14 saves in the match, some of them spectacular, and provided the assist on Jermaine Jones' first ever MASL goal and point. Ex-U.S. ace Jones bagged the tally that very nearly stood up as the game-winner, exploding past an opposition player and blasting a right-footed rocket inside the far post for a sequence of moves which subsequently lit up social media with comparisons to the German-American's goal against Portugal in the 2014 FIFA World Cup. Jimmy Nordberg was full of praise for both Toth and Jones. "Chris is amazing," said the man in charge of Ontario when asked about his 29-year-old shot-stopper. "He made several key saves and really dominated the run of play in the second half because we were the aggressor on the attack and involved him with the ball quite a lot. Not least thanks to him, we forced Tacoma to defend for long stretches and were able to bounce back and take it to overtime." He continued, "Jermaine is obviously still learning the lay of the land with the indoor game, but you saw him get better and more comfortable in each quarter. Big-game players come in and do big things, and the fact he got that goal shows that he has tremendous guts. Obviously this week he's been back in training, so he's been getting more time on the ball and more information on how we play, which is huge for him. Jermaine is a winner and he's bringing an atmosphere and a culture to the team that was very much needed." Next up for Nordberg's side is the meeting with visiting El Paso this weekend, followed by three more games at Citizens Business Bank Arena to wrap up the regular season. Currently sitting at 9-11 and holding the head-to-head tie-breaker against 10-10 Tacoma, Toth, Jones and company are now being favored by some to reach the MASL playoffs. However, the Fury Head Coach cautioned against excessive optimism and called on his club's supporters to do their part to help power a run of convincing performances. "No one is relaxing yet because the job isn't done," said Nordberg. "We know what's ahead and we're taking it one game at a time. That said, we're very confident because all of our remaining matches are at home. The guys thrive on playing in front of our own fans, so hopefully people will show up and support this group to push us to the next level. We really need that seventh man to come through." The upcoming match against El Paso is not Ontario's first clash with the Southwest Division outfit in 2018-19. Back on February 17, Nordberg's squad earned a dominant 12-4 home victory over the Coyotes that featured plenty of attacking fireworks, including a four-point performance by veteran Victor Quiroz and a three-point performance by 22-year-old Brazilian Maicon de Abreu. Recalled the Fury Head Coach, "The keys for us back then were moving the ball quickly and putting away early chances. If we can do that again, we'll be very tough to play against. If we're focused throughout the match, I believe we can take another big step toward making our campaign a success." In addition to Toth and Jones, the Ontario squad features a quintet of attacking weapons in defenders Quiroz (leads active roster with a 1.9 goals-per-game avg., 2nd on team with 10 assists) and De Abreu (tied for active roster lead with 14 goals, tied for 2nd on active roster with 18 points), midfielders Juan Carlos Gonzalez (leads active roster and tied for team lead with 25 points, tied for active roster lead with 14 goals, leads team with 11 assists) and Anibal Echeverria (2nd on active roster with a 1.5 points-per-game avg. ), and forward Francisco Cordeiro (tied for 2nd on active roster with 18 points). Former Fury striker Adrien Perez (25 points, 20 goals, 2.5 points-per-game avg. ), who led the MASL in scoring before landing a contract with Major League Soccer (MLS) outfit Los Angeles Football Club (LAFC) a month ago, has not been a member of the active roster since then. While El Paso has tallied a respectable 116 times during the current campaign, Head Coach Jesus Enriquez's side is dead-last in the Southwest Division standings at 3-17 and league-wide in goals conceded with 179, courtesy of a free-flowing style that has not not always been conducive to defensive discipline. 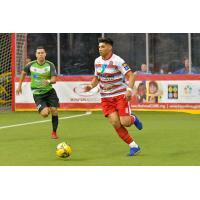 The Coyotes attack is spearheaded by star midfielder Hugo Puentes (6th in MASL with 43 points, 7th with 25 goals, tied for 7th with 18 assists, tied for 9th with a 2.4 points-per-game avg. ), who frequently receives help from forward Jose Moreno (2nd on team with 13 goals) and a pair of offensively inclined defenders in Diego Salas (2nd on team with 23 points, tied for 2nd with a 1.4 points-per-game avg.) and Alex Caceres (2nd on team with 16 assists, tied for 2nd with a 1.4 points-per-game avg.). Looking ahead to the final stretch of his team's regular season, Ontario Head Coach Nordberg closed on a positive note. "I like where our head space is at," he offered. "We've had injuries and adversity, but right now we're healthy and have everyone believing we can pull it off. That means we're peaking at the right time. We have, in my opinion, the best 'keeper in the league and have added some real quality pieces that could push us over the edge. I'm really excited about that and think that we have what it takes to not just handle business in these last four games but also make some noise in the playoffs." The Ontario Fury looks to further boost its postseason odds when it takes on the El Paso Coyotes in Jermaine Jones' home debut this coming Sunday, March 24. Tickets to all Fury games at Citizens Business Bank Arena may be purchased by visiting www.ontariofury.com or by calling 909-457-0252.